Finnish studio 10tons has revealed that its "full contact tennis game" Tennis in the Face will launch on the Switch next Friday, priced $4.99. 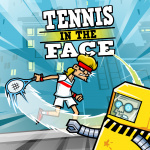 Described as a "physics based puzzle game with slapstick humour" and boasting 120 "increasingly challenging levels", Tennis in the Face places you in the plimsoles of former tennis star Pete Pagassi, who has "sworn to rid the city from the grasp of the corrupt energy drink manufacturer Explodz Inc". Outside of its outlandish energy drink-inspired storyline, this is a straightforward arcade game which revels in the base appeal of hitting people with balls. Lively presentation belies comatose gameplay, but its simplicity serves as a solid palette cleanser between longer gaming rallies. Will you be ordering in the strawberries and cream for when this launches next week? Let us know with a comment. I know this is very different but hearing "tennis" on Switch makes me long for a Mario or Virtua version. I'm just gonna wait for Tennis World Tour to come out next year for my tennis fix. Instead of Tennis in the Face, I'd rather have Virtua Tennis in its place. Nah,nothing wrong with titles like this as long as they're priced right and at $4.99, I'd say it is.Still, not for me. I played through this and its sequel Baseball Riot on Vita (bought them on sale for $0.99 each). They're surprisingly fun and worth a buck or two. I wouldn't recommend this at $4.99, but I would endorse a purchase if they ever go on sale. If only Wii Tennis were a turn-based puzzle it would have sold more. ...ok, that is a very clever trailer indeed. I bought this for a dollar, yeah it's a dud. Can't recommend it at all. Awesome! (sarcasm) 10tons has new source code to milk every week for the next month! First they spewed out twin stick shooters, now it's the second game in their angry birds knock off (King Oddball was first I think - even has the same level screen!). Seriously not impressed with them clogging the eshop with constant generic regurgitated bilge. Angry birds has some serious competition. This game was mildly entertaining when I got it for "free" with PSN on the PS3. But I would not pay more than fifty cents for this. Even then I might wait for a sale. But I have a feeling the Switch will get a ton of these types of games. I think it is inevitable, but I sure hope stuff like this does not overtake the Switch eshop. But it will become a MM soon. They should have called it Tennis in your face! Meh, just another Angry birds!